The De’Longhi Magnifica 4200.S is a simple, easy to use bean to cup machine, and would be an ideal choice for those purchasing their first BTC machine or for those who don’t want to spend too much. It has a few handy features including front loading water reservoir, self-cleaning, and water empty/grounds full notifications. It lacks some of the features you would find on the more expensive machines, such as pre-programmable drinks or OLED touchscreen display, but those omissions are not essential and help keep the price down to a respectable and affordable level. It can be a little noisy in operation and the build is a little plasticky, but the vast majority of buyers who just want a good cup of coffee and don’t care too much about the frills will be happy with their purchase. 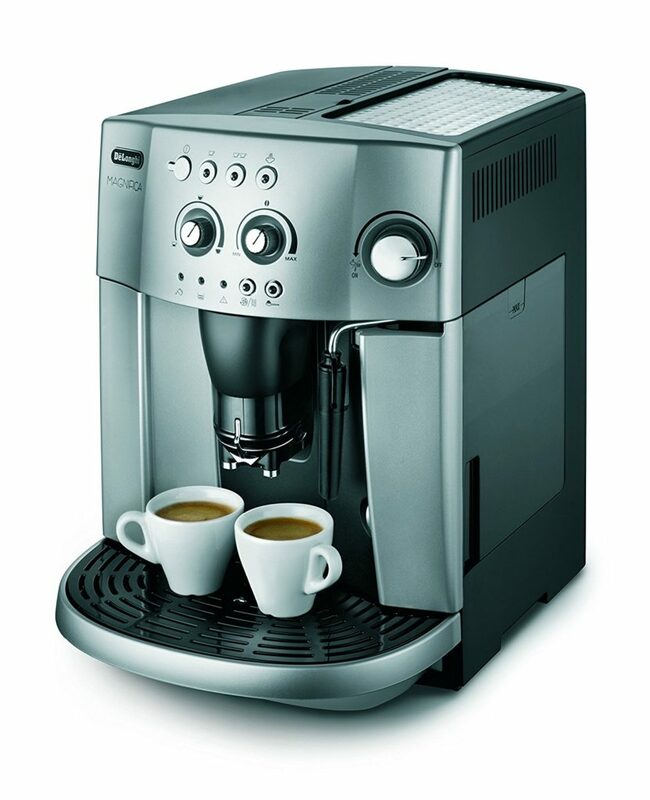 The is the entry-level machine in De’Longhi’s bean to cup range. There are more expensive De’Longhi machines available such as their Jura range, but this retails at around the £300 mark at the time of writing. Naturally with a lower price point, there have to be some compromises somewhere and with the ESAM 4200.S (catchy name by the way) it appears to primarily be in the build materials. Whilst not an ugly machine, it feels a little on the plasticky side, without the sleek chrome or brushed steel of machines such as the Krups Evidence. Of course, this doesn’t affect the actual coffee produced a jot, so it’s a personal preference, you may like the way it looks or just not really care. Having said that, it is certainly sturdy enough, with a 1.8 litre water capacity and measuring 37.5 cm x 28.5 cm x 36 cm the footprint is reasonable, if a touch on the large side. The ESAM 4200.S sports a few cool features that really come in handy in a BTC machine. There is the option to use whole beans or pre-ground. The compartments for these two are completely separate so you won’t be getting any pre-ground mixed in with your freshly ground beans. It’s unlikely that you’ll be planning on using a whole lot of pre-ground coffee once you purchase a BTC machine, but it’s nice to have the flexibility and choice all within the same unit. The water compartment is situated on the front of the machine and slides out. That may seem like a small detail but it’s really convenient not to have to pull the machine out to lift a water compartment out from the top or the back, particularly if you are going to house the unit under kitchen cupboards as I have mine. The ESAM 4200.S also has a self-clean function to pump some water through the system and flush out the pipes. This runs each time you switch the unit on and it’s great for ensuring your coffee tastes amazing and you don’t get any stale water in your cup, but it’s a bit noisy and can fill up the drip tray if you forget it’s going to happen and don’t put a cup in place to catch the flushed water. But this is a minor niggle. The unit is very simple to use. There are two main dials on the front of the machine and these dictate how much water you want in your coffee and how strong you want your coffee. It can take a bit of trial and error to work out how you would like these set, which obviously isn’t an issue with some of the digital BTC machines, but once you’ve figured it out you can essentially leave these alone. There is also a large knob for activating and controlling the steam for the milk frother. Other handy features include notification lights on the front of the machine to let you know when your water needs refilling or the coffee grounds need emptying. There is also a notification light to indicate that the machine needs to be descaled. The only slight gripe here is that there is no notification for when your beans are running low, so if you don’t keep an eye on your bean-level you can end up with a rather watery coffee and have to start again. Overall, this is a perfectly good machine and if you aren’t too fussed about frills such as pre-programmable drinks and OLED touchscreens and you just want great quality coffee from beans, then this would make an excellent first bean to cup. A couple of small issues that detract a little from the ESAM 4200.S are that it can be a little noisy in operation (although no BTC machine is silent – grinding beans isn’t a quiet process!) and as mentioned previously, the build is a little plasticky, so if you want chrome shine then maybe look elsewhere. But for the price, it’s difficult to make too much of an issue out of either of these points and I’m certain that the vast majority of purchasers will be extremely satisfied.